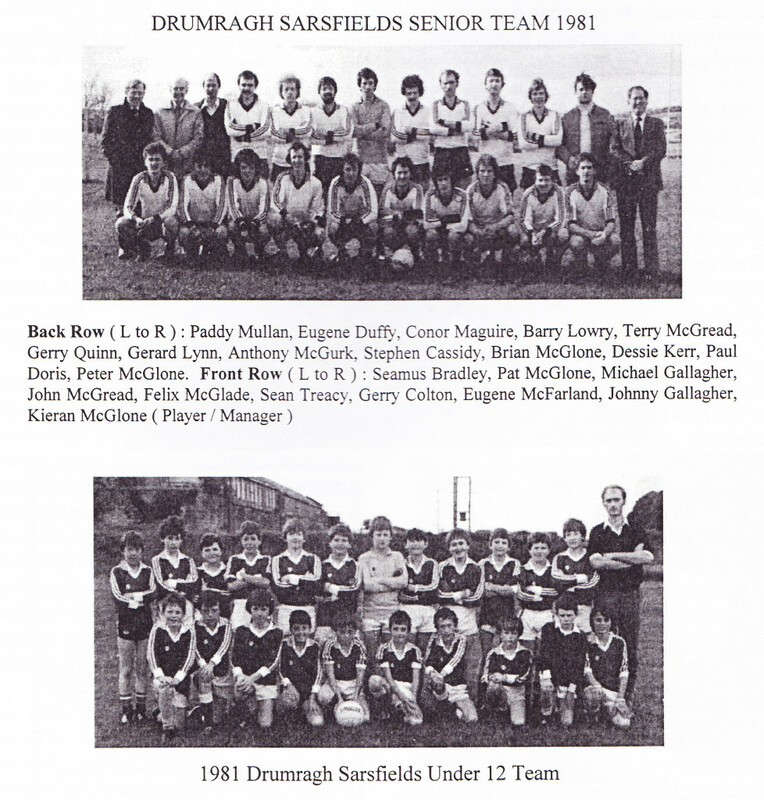 Drumragh Sarsfields GAC was formed in 1972 after the amalgamation of Tattysallagh St Eugenes and Tattyreagh St Patricks. St Eugenes, founded in the late 1890s was one of the oldest clubs locally, and won the County Junior Championship in 1942. 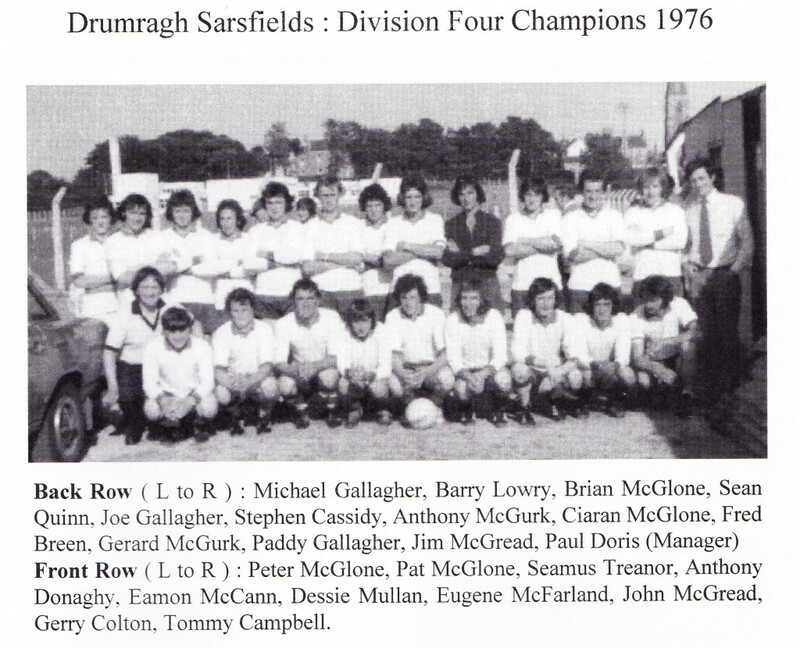 Drumragh Sarsfields officially came into being on Sunday 16th January 1972 after a meeting between representatives from both Clubs. The merger was brought about due to the low number of players in each Club. 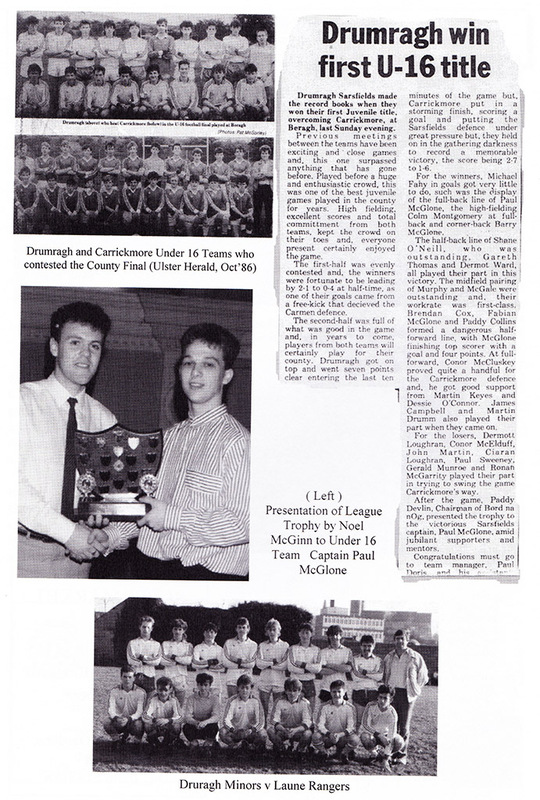 Press cutting about the first meeting of the newly formed Drumragh Sarsfields GAC. Over the next 43 years the new Club on the block would go from strength to strength and grow to become one of the biggest Club’s in the County. Take a look at our best moments from the last 43 years. 1972– Senior & Reserve teams were fielded in the West Tyrone Intermediate League. While no trophies were won, both teams had a successful 1st season with the Seniors finishing mid-table. 1972– Barry Lowry represented the Club on the All Ireland winning Tyrone Vocational Schools Team and the Tyrone Minor Team. 1973– Drumragh fielded teams at Under 16 & Minor for the first time. A particular highlight for the Under 16’s was reaching the Championship Final after beating Omagh St. Enda’s. 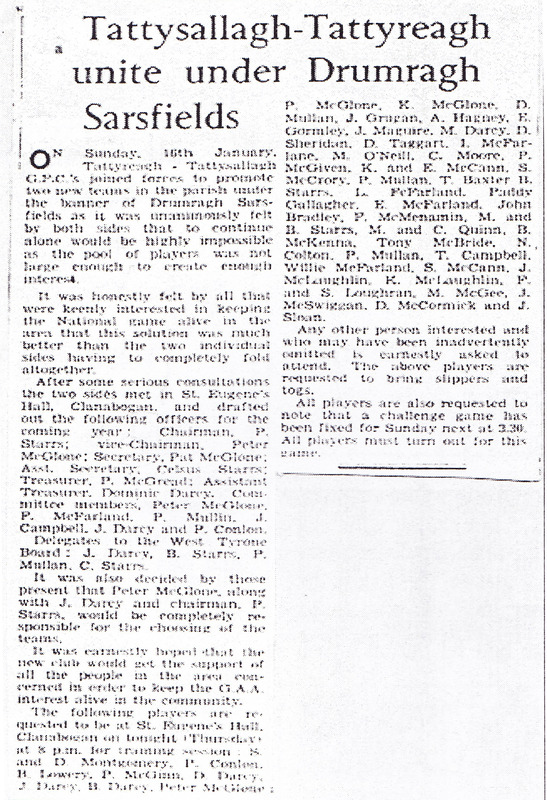 1973– The McDermott Cup was played for for the first time. The competition included teams from Downpatrick, Trillick, Scotstown, Beragh, Lavey, Letterkenny, Clan na Gael and Bundoran. 1973– Stephen Cassidy represented the Club on the CBS MacCrory Cup winning team. 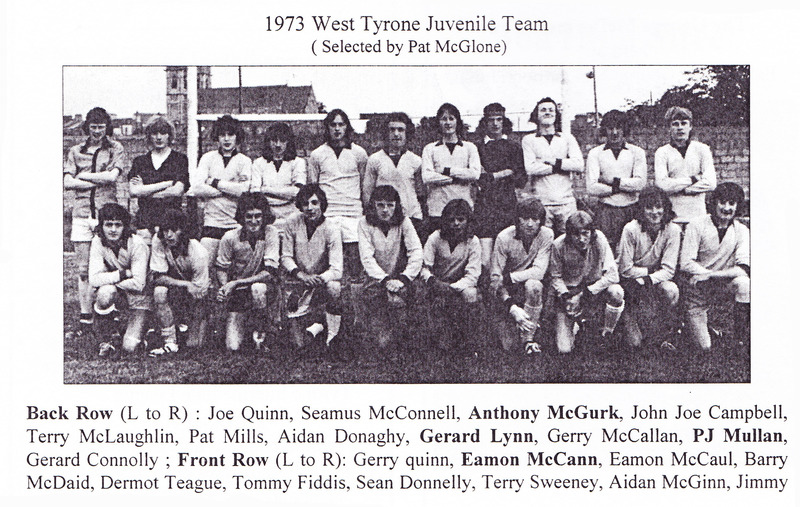 1974– Jim McGread and Paddy Gallagher represented the Club on the All Ireland winning Tyrone Vocational Schools Team. 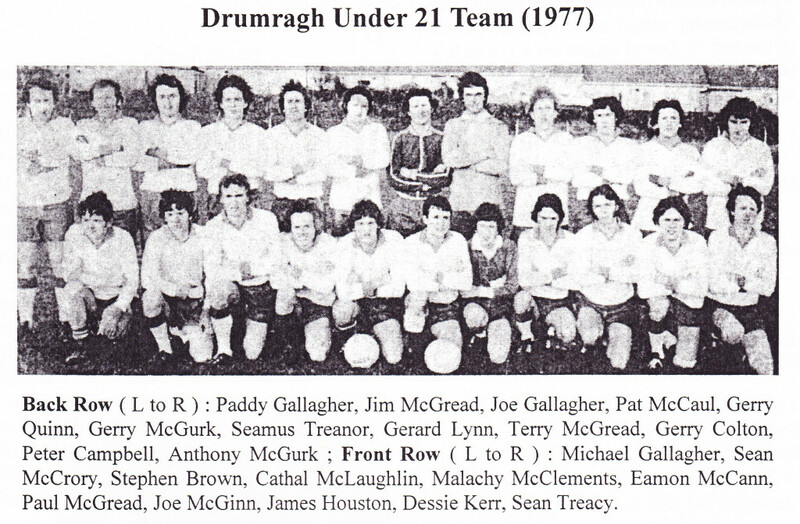 1976– Drumragh won their first County Title- the West Tyrone Division Four League. The Senior team played 14 games; winning 11. The title was clinched at Home to Aghaloo on Sunday 5th September after winning the game 4-9 to 0-4. 1976– Fred Breen represented the Club in the Tyrone Senior Team, lining out as Goalkeeper. 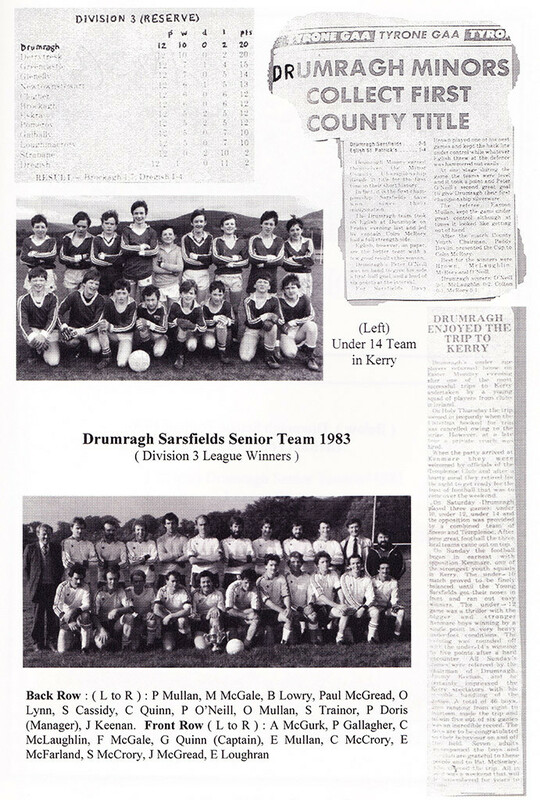 1976– Drumragh also won it’s first Scor title when the Quiz team won the Tyrone & Ulster title. 1977– A particular highlight for the Senior Team from this year was the Double win over the newly demoted Omagh St. Enda’s. 1977– The Under 21 Team reached the County Final. The path to the final included wins over Cappagh and Sean McDermotts. The final took place on Sunday 8th January against Clan Eireann, a merge of Derrylaughlin, Clonoe, Mountjoy & Derrytresk. 1977– In Scor na nOg, the Club added to it’s trophy cabinet with two County titles in the Ballad and Quiz. 1978– The Club suffered a great loss when Paddy Starrs snr. died. Paddy had been Chairman of the Club since it’s formation and has been elected President earlier in the year. 1979– Louise George guided the Club to another Scor na nOg title in Recitation. Also work began on changing room’s at St. Pat’s Park. 1983– The Minor’s reached the Grade II County Final which was played against Glenelly. 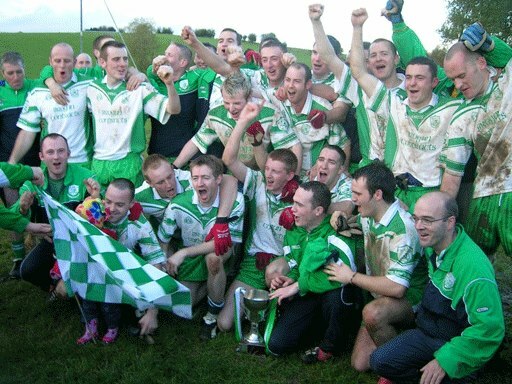 The first Minor County Title was won on a scoreline of 1-7 to 0-4. 1983– The Reserve Team also had similar success, completing the Double and winning both the League & Championship titles. The Reserves overcame Loughmacrory in the Championship Final and Derrytresk in the League Final. 1983– The fourth County Title of the year came from the Senior Team. The win over Strabane in the penultimate match of the season confirmed that Drumragh would once again be playing Division 2 football. 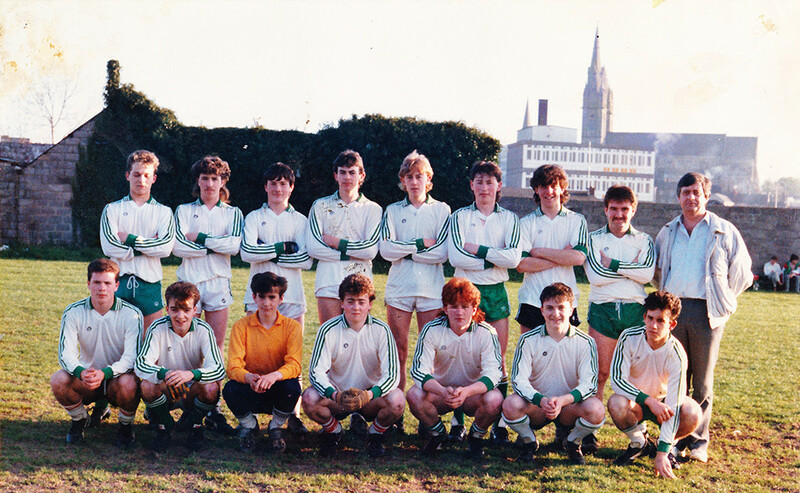 1984– The Under 14 Team claimed the Club’s first County Title at this age. Drumragh beat Dungannon at Cookstown with a final score of 4-11 to 0-1. 1985– Under the management of Paddy Mullan, the Reserves repeated their success of 1983 by winning the League & Championship. The Team was beaten only twice in the League and beat Urney at Healy Park in the Championship with a scoreline of 3-4 to 1-2. The page spread prior to the Under 14 Final. 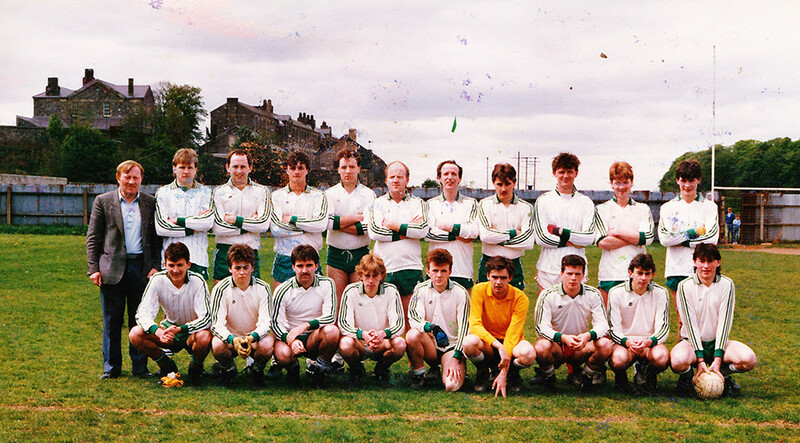 1986– The Under 16’s won the League and brought back the Club’s first title at Juvenile level. The Team beat Carrickmore in the Final after coming through the group unbeaten. The final took place in Beragh with a final score of 2-7 to 1-6. 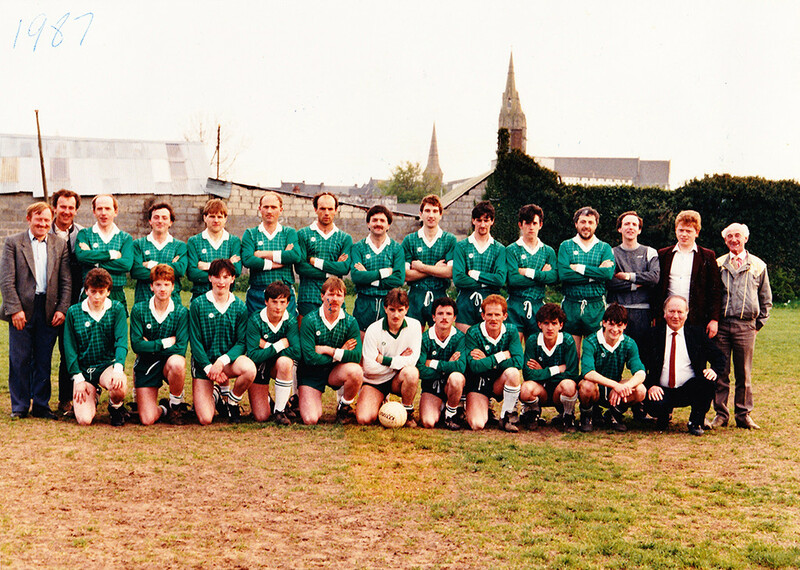 1987– One of the Club’s greatest success’ came when they won the Junior Championship on Sunday 27th September 1987. 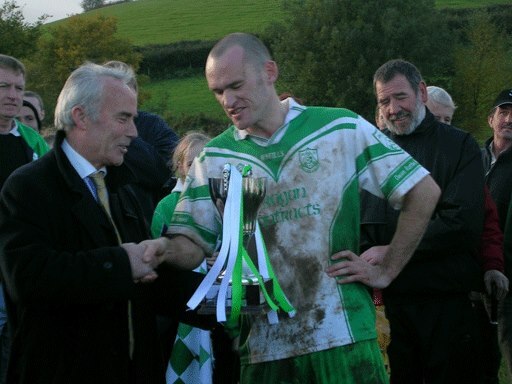 The Team met Urney at Pomeroy after beating Dregish, Strabane & Greencastle to reach the final. The young team went on to win 1-9 to 0-3 with Captain Enda Mullan lifting the trophy. 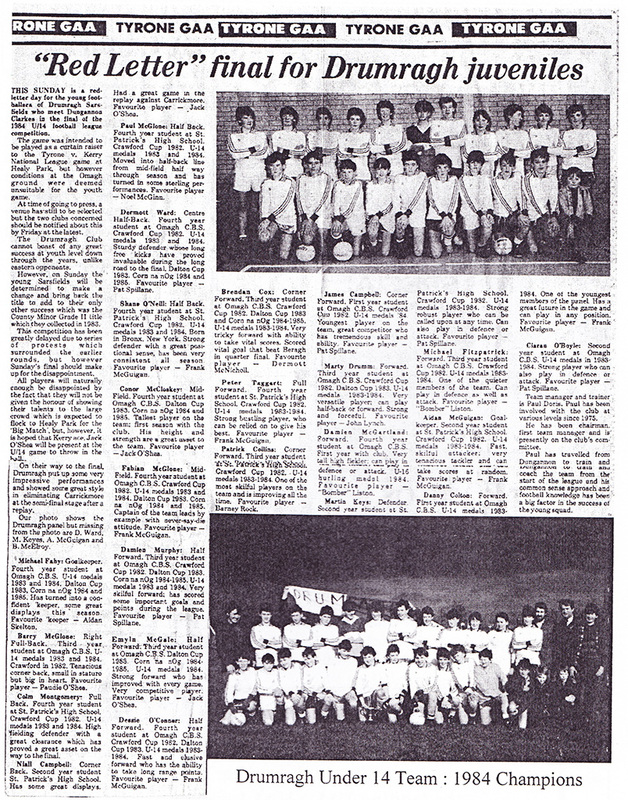 1989– The Under 12 Team won their League after recording seven victories from seven games. This represented the Club’s first title at this age grade. 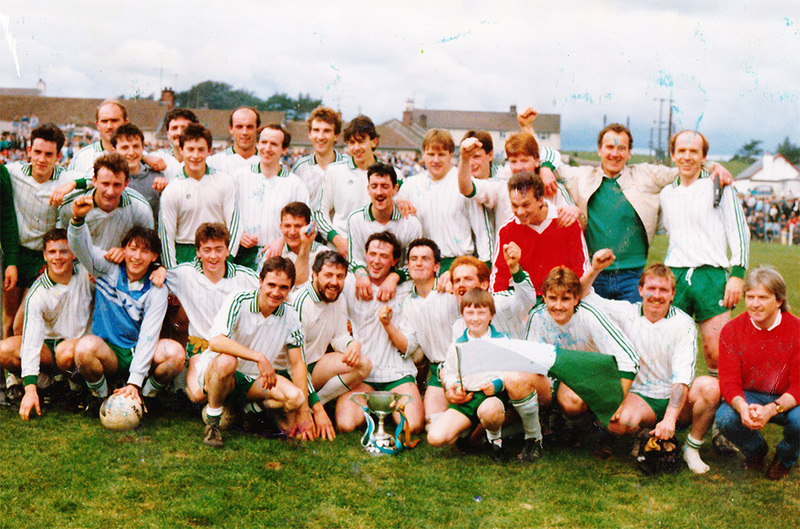 1989– The Reserve Team, fuelled by a particularly strong Minor Team, once again picked up the Championship Title after beating Urney with a score of 1-8 to 0-5. 1994– The Club kickstarted it’s winning ways with a Scor Title in Ceile Dancing. 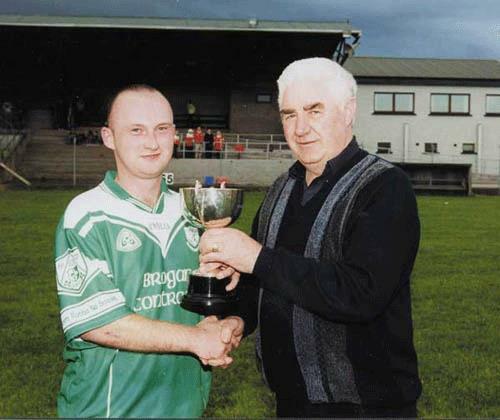 1999– The Club won it’s most prestigious title yet when the Senior Team beat Stewartstown to win the Junior Championship for the second time in it’s history. 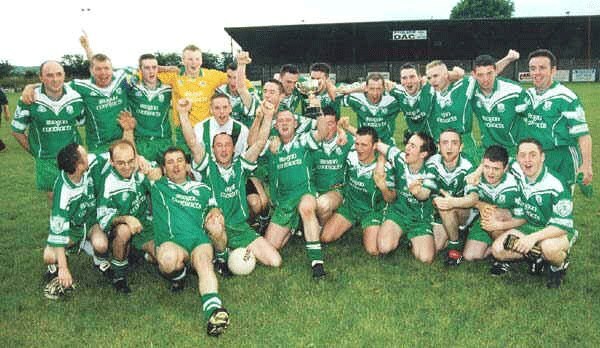 2002– The Reserve Team added yet another County Title at this level. 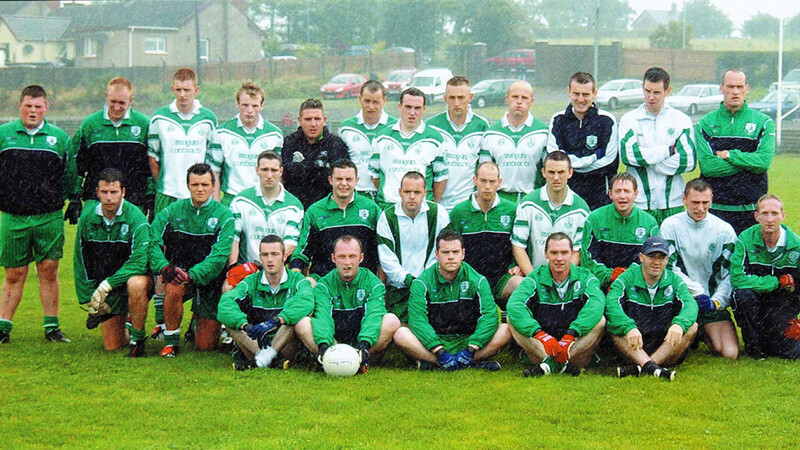 2004– Drumragh once again moved into Division 2 after winning the League in 2004. Under the management of Seamus Woods, the Senior Team came through the season in strong form.